Fast50s z50 Triple Clamp made from Billet aluminum. Fits 1969-1999 z50's and 2000-03 Jincheng Lynz 50 as well. Moves you forward and up so that you're more comfortable for any ride. So forget about banging your knees anymore! Holds any 7/8 bar without slipping. Built to last, looks amazing , great company and fits like a glove, not only does it handle better but also looks insane! I bought mine in red. 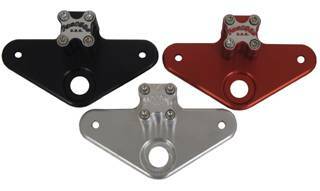 The anodizing is very high quality as well as the machining work. Definitely a nice upgrade in the looks department as well as strengthening up the fork assembly!